This is frightening: Look at how many people, in each state in the United States, are opting not to vaccinate their kids. The actual numbers reflect kindergartners whose parents checked "exempt" when asked about immunization on school forms. Just because the child was marked exempt doesn't necessarily mean the child wasn't vaccinated. Still, that is quite often the case. And in many states, checking a box is all it takes to skip vaccination. In a 2012 study of vaccine exemption policies across the country, a team of researchers led by Saad Omer, a professor of public health at Emory University, found that of the 20 states that allowed personal belief exemptions for enrollment in a public school or child-care program, less than a third made it "difficult" to do so (for instance, by making parents re-apply for one each year, explain their beliefs in writing, or get a notarized letter of approval from a health care provider). In the nine "easy" states identified in the study, the rules required only signing a form. Indeed, Omer suspects that some parents sign vaccine exemption forms not because they actually hold anti-vaccine beliefs, but simply because it's easier than juggling the doctors' appointments, missed work, and other inconveniences of getting kids vaccinated. The study found that an astonishing 49 percent of toddlers born from 2004 through 2008 hadn't had all their shots by their second birthday, but only about 2 percent had parents who refused to have them vaccinated. They were missing shots for pretty mundane reasons—parents' work schedules, transportation problems, insurance hiccups. An earlier CDC study concluded that children in poor communities were more likely to miss their shots than those in wealthier neighborhoods, and while that may not be too surprising, it's still a dangerous pattern. "If you're going to delay one or two vaccines, it's not going to make a huge difference," says the new study's lead author, Jason Glanz, an epidemiologist at the Kaiser Permanente Colorado Institute for Health Research. "But you could also think of it like this: If a million kids delay their vaccines by a month, that's time during which a disease could spread." 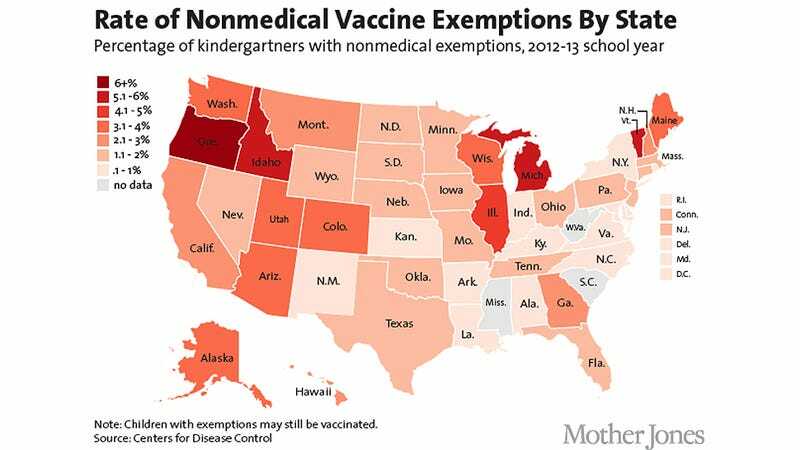 Non-medical vaccine exemptions are dangerous because they threaten what's known as "herd immunity:" Diseases simply can't spread in a community where a high enough percentage of the population is vaccinated against them. The required percentage of vaccinations to ensure herd immunity varies by disease; for pertussis (whooping cough), it's between 93 and 95 percent, according to Johns Hopkins' Jessica Atwell, lead author of a study on pertussis and vaccines published last year in the journal Pediatrics. In California, the percentage of kindergartners who get their full set of shots has been dropping since 2008, while the rate of personal belief exemptions jumped by nearly a percentage point in that time. Given that the national average exemption rate is 1.8 percent, that's a big increase. During a California outbreak of pertussis in 2010, more than 9,000 cases were reported, and ten infants died. It was the worst outbreak of whooping cough in 60 years. Yikes. More maps and statistics here.